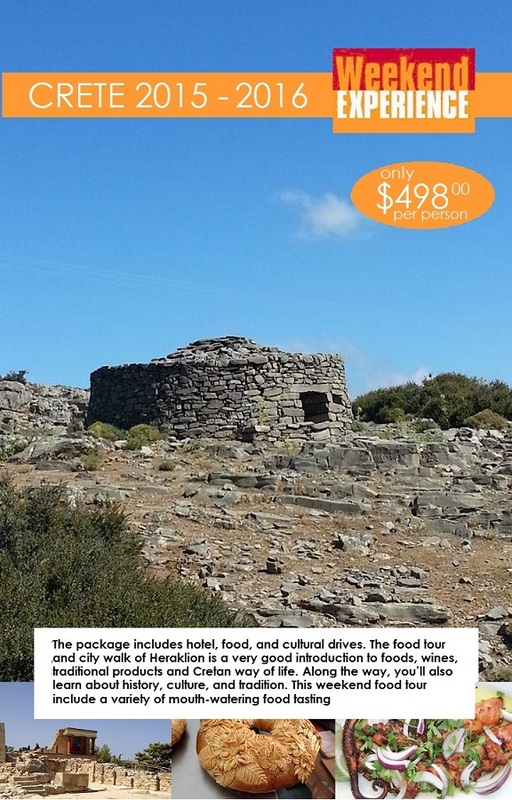 As Crete boasts of the unique culture and cuisine and Cretans knows that they have the finest gastronomical, tasty and healthy solutions proved and signed by the medical science society (Cretan Traditional Mediterranean Cuisine and Nutrition), this weekend food and wandering break is an excellent way of experiencing the all the aspects in one + one exciting day out. You will experience the best street food of Heraklion, the beautiful sight of the palace of Knossos, the delightful taste of Cretan Shepherds traditional cuisine in the mountains of Crete. This unforgettable journey into the cultural and gastronomic heart of Crete will satisfy every appetite. We pick you up from the airport of Heraklion or port or your hotel when you are already being in the city. We drive to the center of the city and the tour start from the heart of the city and come to the PLATIA KORNAROU with first visit a small family run shop selling small quantities but high quality cheeses and taste few of them with a shut of Raki. The owner-cheese maker will welcome us with a variety of Cretan cheese to taste and they will talk to us about the various ways each one is produced. We will taste few different kinds of cheeses as fresh soft white goat cheese called Mizithra, and same cheese matured few months called anthotyros as well as Graviera, the Cretan, Gruyere, and Kefalotyri both made from lamb and goat milk fresh and matured older cheeses with a stronger taste as well Next break just opposite to drink a cup of Greek coffee the traditional way cooked in hot sand. Keep walking the central market and stop for an OUZO (anise) with MEZE (small bites –like tapas - accompanies the spirit) at one of the traditional Mezedopolion of the street. We will be part of the local noisy people. Visit the cathedral of the city Saint Minas, and then the Morozini fountain at the heart of the city, the Venetian church of Saint Marcus / now gallery, the church of Saint Titus. We do a break for mesimeriano the Greek “lunch,” Americans usually treat “lunch” as the sober half hour with which they break up their work-day. The Greek mesimeriano, on the other hand, rarely begins before two in the afternoon and often lasts for a couple of hours because of the Mezedes, the appetizer-sized plates of Greece, which are ordered in abundance with a variety of dishes that highlight Cretan and Greek cuisine. and shared around the table. This occasion for drinking and dining is treated as a ritualized occasion for pleasure, sustained conversation and relaxation. We end our walk after lunch visiting and taste the famous “loukoumades” (Cretan style doughnuts sprinkled with honey and sesame) there are just amazing. When you put them in your mouth they are just a fried little ball, but when you bit them the honey come flooding out over your tongue. Lastly a visit to the best small pastry shop in the city. Gloria: Artistic feeling + imagination + pure fresh ingredients = fascinating the palate in taste and quality elevating your senses to heaven: We taste the: Galatoboureko: custard cream and filo pastry in syrup and: trigono:: cheese cream and filo pastry in syrup. Incredible taste never have taste anything like that!! Drive you to the hotel and leave you relax taking a nap and get ready for the dinner. We will come and pick you up at 8, 30 pm for joining a dinner Cretan style at Petoussis place. The menu includes some of the most popular dishes as “gamopilafo (rice pilaf cooked in lamb broth), antikristo (lamb cooked the Cretan shepherds paradila style facing the fire), fried zucchinis and zucchini little pies, and bekri meze (pork bites cooked in wine) and their special garlic bread (something like a tasty garlic flavor pizza) accompanied with local wine and raki. We drive you back to the hotel to spend the night in the city of Heraklion. Αναρτήθηκε από George Portokalakis στις 11:36 π.μ. George Portokalakis 8 Οκτωβρίου 2015 - 11:38 π.μ. If you’re travelling through Greece, and you may only have one weekend to spend in Crete what should you see and do if you only have a couple of days in the Cretan capital city? Experience the best street food of Heraklion, the beautiful sight of the palace of Knossos, the delightful taste of Cretan Shepherds traditional cuisine in the mountains of Crete. This unforgettable journey into the cultural and gastronomic heart of Crete will satisfy every appetite. Mike Paine 3 Σεπτεμβρίου 2018 - 3:58 π.μ. We shall be interested in exporting to Greece too. Infact i shall be in Athens on 16th march.. If inerested to discuss further please reply with what kind of clothes you are looking for.. what quantities ect.